It is hard to think about sorting out your estate and the decisions that need to be made. However, once a will has been written it often brings with it peace of mind to know that things are in order with your family and friends being looked after. Writing a will also helps us to think about the lasting legacy we will leave and leaving a gift to charity is one way to enable this to happen. The Batten Disease Family Association is the only charity dedicated to supporting those affected by Batten Disease in the UK. Your gift will help our work to continue; helping to support families on their journey, bring awareness to Batten Disease and to fund research in the hope that one day soon a cure may be found. There are many options when it comes to writing a will but it always recommended to seek professional help and advice to ensure that your will is comprehensive and to ensure that all the legal formalities are included to ensure that your will is valid. With this comes the peace of mind that your wishes will be carried out just as you intended. You can find a local solicitor by contacting the Law Society (http://www.lawsociety.org.uk/home.law). The cost of using a solicitor will vary according to how complicated your will is and the country you live. The solicitor should make it clear how much they will charge. Banks: Some high street banks are still able to help with will writing. Please contact your own bank for further information. The BDFA cannot recommend a particular solicitor or will writer. Before visiting your chosen solicitor or will writer or bank it is suggested to draw up a list of your Assets and Debts.This will help in showing the size and type of the estate you will potentially be leaving. When you are planning your will it is important to ensure that your loved ones are taken care of. After looking after your family and friends, you may wish to leave a gift in your will or legacy to the Batten Disease Family Association. To do this you must include our full name – Batten Disease Family Association and our Registered Charity Number: 1084908 and our registered charity address: BDFA, PO Box 504, Fleet, Hampshire, GU51 9GE. This combination of information will ensure that your gift is received safely. Your solicitor, Will Writer or Bank can help with the suitable wording for your gift as this will depend on the type of gift you are choosing to leave. Residuary Legacy: This is a gift of the remainder or a percentage of your estate after all the other legacies have been made and debts cleared. Pecuniary Legacy: This is a gift of a fixed sum of money. Specific Legacy: This is a gift of a specific item in your will. Reversionary Legacy: This is a gift which someone can benefit from in their lifetime e.g. a house, but when they die it could then pass to someone else, for example a family member, a charity etc. It’s important that your will is kept up to date to ensure that your final wishes are carried out in the way that you would like them to. 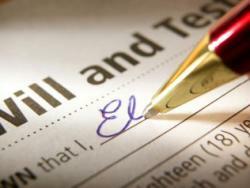 It is normal to review your will at major life events e.g. entering a committed relationship, becoming married, when you have children / grandchildren, when there is a death, separation or divorce etc. Thank you for taking the time to think about making a will and leaving a lasting gift to the Batten Disease Family Association.